After postponing his nose surgery because of his Smart Gilas Team Pilipinas stint in the recently concluded FIBA Asia 2011, the 6'7 forward and a native of Cavite, Ranidel De Ocampo has finally decided to undergo a nose operation. 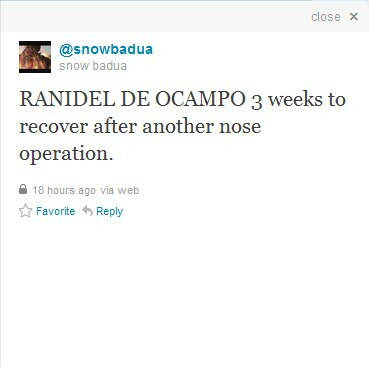 And sadly, according to Snow Badua, Ranidel's nose operation will take atleast 3 weeks to fully heal. Going back, Ranidel suffered that painful nose injury when the Talk 'n Text Tropang Texters (TNT) had a pre-game scrimmage before their first playoff game last PBA Season 36 Governors' Cup. Since then he has worn a protective face mask. Now, TNT may miss Ranidel's services for at least 3 weeks. If that happens, they will miss the 13.3 points and the 5.62 rebounds contributions of Ranidel De Ocampo. Thanks for sharing, nowadays most people are engaging themselves in some surgery including rhinoplasty,its one of the common surgery of today's generation and I'm pretty sure that lots of people are still looking forward to try it.